​Dorothy A. (Alley) Dettor, a long time resident of Whittier, went home on March 29, 2019, after a courageous battle with cancer. She was 95. Mrs. Dettor was born on February 29, 1924, a leap year, in the small coal mining town of Dante, Virginia. She met her husband, Harold Dettor, while she attended Science High School in Johnson City, Tennessee, and they were married December 31, 1947. They relocated to Whittier, California, in 1956. Mrs. Dettor worked at Meyers Department Store in Uptown Whittier and retained her position in the Credit Office through their acquisition by the Boston Stores. Later she worked at Whittier College as the Switchboard Operator and with her still noticeable southern accent, was known to family and friends as "The Voice of Whittier College." Mrs. Dettor retired in 2003. Dorothy was an incredibly kind soul and made friends easily. She enjoyed gambling outings to Laughlin, Pechanga, and to the lake with her friends, and relished in the infrequent "big win" at the penny machines. 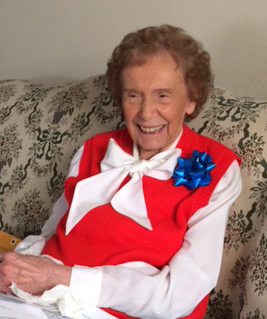 Dorothy was a frequent attendee of stage shows at local venues and loved being with her friends. She had an enormous capacity for forgiveness, even to those who sought to take advantage of her trusting nature. Dorothy cherished the company of her close friend, Donna, and Dorothy's family will be forever grateful for the compassion, comfort, and friendship she provided. Dorothy was loved by all who knew her and she will be dearly missed. Dorothy was preceded in death by her husband, Harold, in 1994. She is survived by her daughter; Sue Cornell (Tim) of Las Vegas, son; Mark Dettor (Kelly) of Louisville, grandchildren; Stacey Muller of Nebraska, Sara Fogle of Arkansas, Michael and Steven Dettor of California, and four great-grandchildren. Worry no more, Mom, your work is done.